The longest running interest for Jackson is place, specifically foreign cultures and their languages. He adores foreign languages, cultures, dance and music. 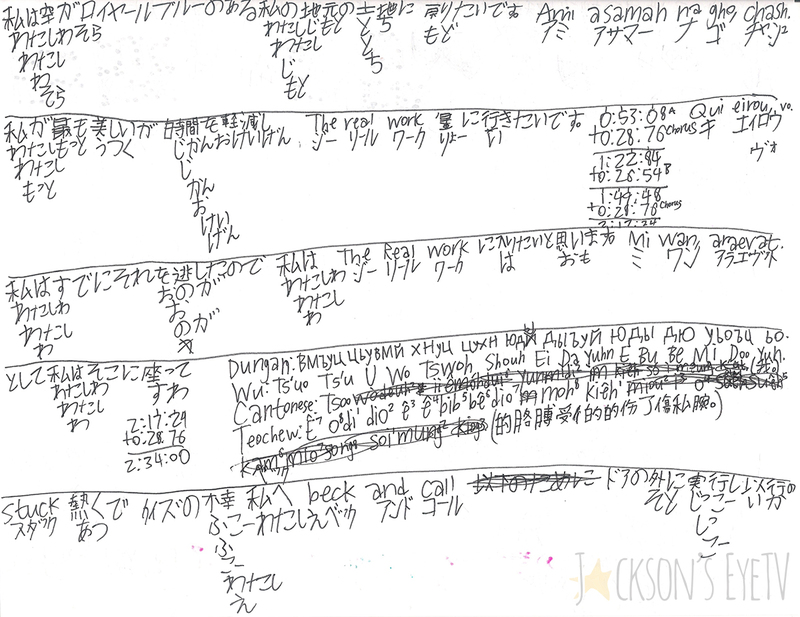 For a child that could not use pragmatic language until age 5, Jackson was always consumed trying to learn foreign languages. He began this interest in preschool when he had a Korean teacher. At this point, he was still unable to speak English outside of basic one or two-word commands, but he would pantomime or scream KOREA over and over again when we visited the public library until I figured out that he wanted me to check out children’s books in Korean. Because he seemed so interested in Asia, and I was so desperate to get him to speak, I bought him a Putumayo CD Asian Dreamland. At this point, I was really just following the advice of the world’s most famous person with autism, Temple Grandin, and pursuing anything and everything that related to one of his interests to try to motivate him to speak or pay attention to the world around him. He loved that CD and listened to it over and over again, and that was the beginning of something wonderful for him. He discovered foreign language music through the Putumayo CDs and then he would only listen to foreign language CDs from here on out. No children’s music for our family, we listened to French, Spanish, Arabic, Hebrew, Japanese, Chinese, German, and on and on. From Korean, he moved into an obsession with Mandarin Chinese, then other Chinese languages, and then onto Japanese. As a young child, he spent hours transcribing the Hebrew dictionary onto classroom whiteboards at Jewish camp while the other children played outside. He has taught himself to read and write basic Japanese. And he can recognize and write/transcribe other languages like Mandarin, Arabic, Korean, Urdu, Afghan Persian, Russian, Dutch, Malay, and it goes on and on. He is currently trying to teach himself to write every Native American tribal language listed on Native-Languages website. This project began five years ago and he has only made it through the Cs so far. From what I observe, he uses Google Translate to look up words and then “translates” books, poetry (Rumi is a favorite) and songs that he writes. I am sure these are not exact translations, but his ability to move between languages is impressive. He also creates his own languages with their own vocabulary. Our neurologist believes that Jackson is a neurolinguistic savant and has recommended that he see Dr. Steven Pinker at Harvard to access his brain to learn more about how some people become linguists who have first-language impairments. Jackson can speak Japanese with more fluidity than he can speak English. Our real hope for him is that his autism will not get in the way of him traveling. He so adores other people and places. 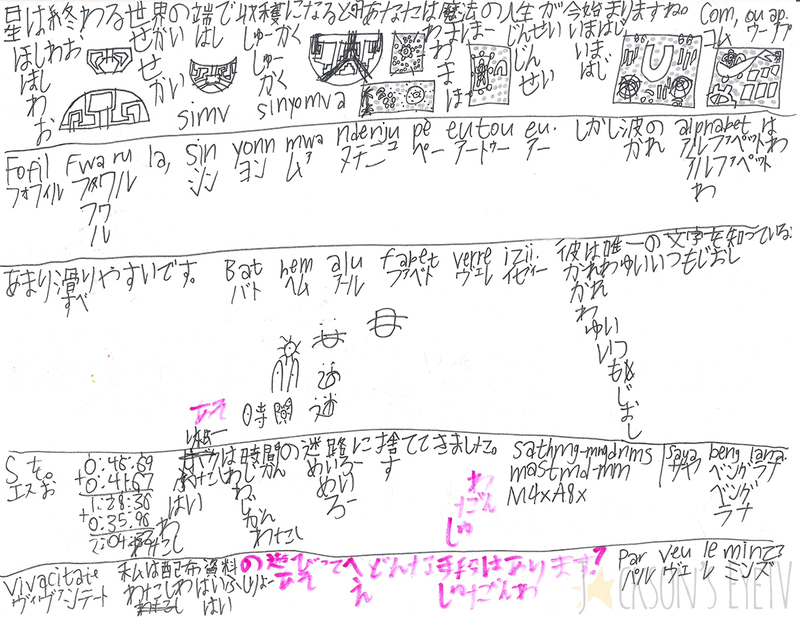 Pages from songs that Jackson is writing or translating.